Find out how diabetes specialists and veterinarians used digital technology to help Quincy the koala. 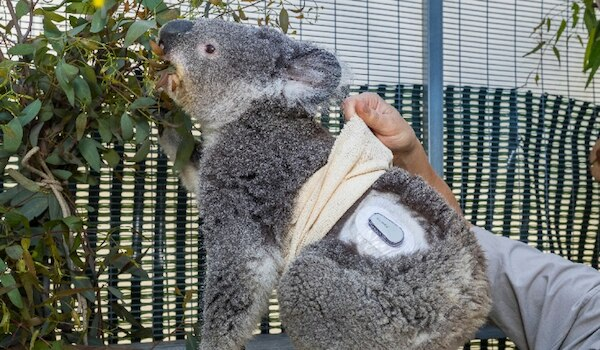 In June 2018, the Scripps Whittier Diabetes Institute and San Diego Zoo formed a first-of-its-kind collaboration to provide Quincy, a koala, with a continuous glucose monitor (CGM) designed for humans to help manage his diabetes. Quincy soon became well known for being one of only a few koalas that have been diagnosed and treated for diabetes. “Working with Quincy allowed us to extend our digital technology into an entirely new population,” said Athena Philis-Tsimikas, MD, corporate vice president for the Scripps Whittier Diabetes Institute, who was part of this effort. In a Los Angeles Times article, Dr. Philis-Tsimikas noted that working with Quincy was similar to working with people who can’t talk or explain how they’re feeling, such as a very young child or a person who is unconscious due to severe hypoglycemia. The CGM transmitted real-time information about Quincy’s blood glucose levels to a smartphone app and sent alerts before Quincy’s blood glucose level became dangerously high or low. Caretakers were able to monitor Quincy’s blood glucose data and adjust his insulin and diet to manage his diabetes. Just as CGMs make managing diabetes easier for people, the CGM made managing diabetes easier for Quincy and his caretakers. According to a press release from the San Diego Zoo, before Quincy received the CGM, zoo staff had to prick Quincy’s skin several times a day to test his blood glucose. With the CGM, caretakers could see Quincy’s blood glucose level without disturbing him. Sadly, in late 2018, Quincy developed pneumonia. According to NBC 7 San Diego, despite comprehensive medical treatment, Quincy’s health declined and veterinarians had to make the difficult decision to euthanize this beloved koala, who had become a mascot of sorts for many people living with diabetes. Watch the San Diego Zoo video below to learn more about how diabetes technology was used to help Quincy the koala. Quincy will be missed. Athena Philis-Tsimikas, MD, is the Corporate Vice President of the Scripps Whittier Diabetes Institute and Director, Community Engagement at the Scripps Research Translational Institute in San Diego, California.